Hi, and welcome to Kickstarter Update #25! Although we’ve been pretty quiet on Kickstarter for the last while, it’s been one hell of a summer for Larian. We’ve poured blood, sweat, tears, and about five metric tons of caffeine into Divinity: Original Sin 2. But, as we’re slowly creeping out of our Dev Cave and back into the sunlight, we all think we’ve got something really special here. Here’s Swen to explain why August is going to be so important to us, and why (we think) it will make you very, very happy. Personally, we love both of these players. The ones who want to dive into the story as quickly as possible, and the ones who want to start creating their own story before they even see the first loading screen. 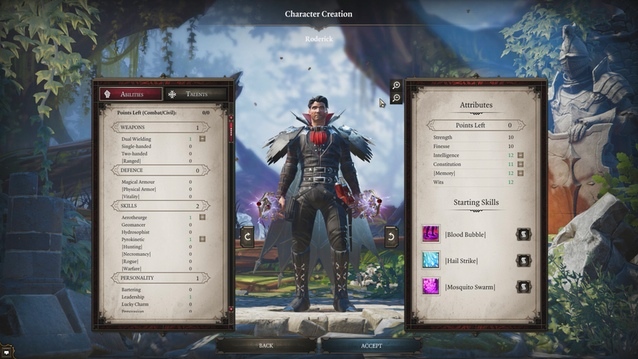 With the character creation engine we’ve whipped up for Divinity: Original Sin 2’s, we think we’ll appeal to both breeds of player. Origin Stories: You’ll have a choice of several origin stories, each one a pre-made past for your character, which will ground them in the world you’re exploring. You might meet people who’ve heard of your story, or suffered a similar fate. You might meet some old friends to help you on your way, or cross paths with those who have a score to settle. The origin stories bring a rich, deep narrative to the game, which compliments the world and gives you lots more options for how you can interact with the people around you. Tags: Tags are the background information about your character which you (mostly…) set at character creation. They cover your background, your profession, your race, your gender, and even how you interact with the world. Tags give your characters depth and variety, meaning that even if you start with a “Blank Slate” character, they’ll still explore the world and interact with it in their own unique way. 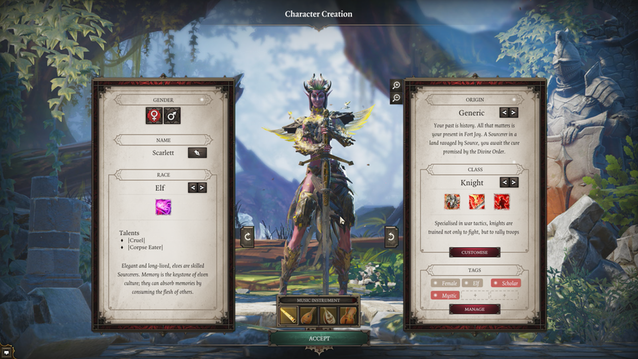 Musical Instruments: One of the new features in Divinity: Original Sin 2 will be the addition of personalized music for your character. Choose an instrument at character creation, and at certain pivotal points in the game, your character’s theme (played on your instrument of choice) will start to dynamically blend into the music of the world. Race: Tired of being a boring old human? Step into the scales of a lizard of the Ancient Empire; see which is tougher: an elf’s bark or its bite; take up the crossbow of an Imperial dwarf; or dust off the bones of an undead warrior. Appearance: Tweak your appearance with more visual choice than ever! Gender: As with everything in Divinity: Original Sin 2, people’s views of your chosen gender will affect how they interact with you. Will their expectations clash with your own? How will other cultures view you? How will you view them? Skills: Choose from a set of skills in a pre-made class, or design your own! Don’t want to be a barbarian or inquisitor? Create your own class, be it PyroWitch, NecroRogue, or WarriorChef! Memory is a new stat (and the one Nick is most excited about!). It takes Memory to memorize skills … and only a limited amount of skills can be memorized at any one time. Your magical library will build skill by skill throughout the game, so investing in Memory will make you more flexible and adaptive on the battlefield. More powerful skills also demand a higher level of memory, so you’ll need to elegantly balance your available Memory against your combat needs. But don’t worry, you can always access skill selection outside of combat. Strength helps fighters with melee weapons. It makes it easier to wear heavy armor, and improves warfare skills. Finesse is for those who want to use bows, crossbows and daggers – the rogues, the rangers, all those sneaky folks. It improves hunting abilities, rogue abilities and gives a chance to dodge. Intelligence mostly helps mages. It improves the power of staffs, wands and most elemental skills. Constitution is useful for vitality. Sage Nick says you should never skip upgrading it, as it can make your life a lot easier (and hopefully longer). Wits boost critical chance, helping to reveal secrets and traps and allowing you to maneuver more skilfully in tricky social situations. Wits also determine initiative and help with persuasion. Physical Armor protects from physical damage. One Physical Armor point absorbs one point of physical damage. As long as Physical Armor is above zero, physical statuses like Knocked Down, Crippled, and Bleeding will not take effect. Physical Armor automatically regenerates out of combat. Magic Armor protects from elemental damage; i.e. damage from fire, water, air, earth or poison. One Magic Armor point absorbs one point of elemental damage. Elemental resistances apply before armor protection is applied. As long as Magic Armor is above zero, magical statuses like Stun or Burning will not take effect. Magic Armor automatically regenerates out of combat. Memory Slots determine the number and quality of skills you can use at the same time. It is possible to learn every skill that you encounter in-game, but you can only keep a handful of them active at the same time. Outside of combat, characters can organize their active skills to prepare for their next encounter. The more powerful the skill is, the more Memory Slots required. Our designer Slava and producer David presenting to Russian press in Moscow. After the excitement of PAX East in April, our team have been getting itchy feet again! It’s time for us to head out into the world to show our game and make some friends. To that end, we have team members from each of our studios flying all over the world to spread the good news over the next month. Yes, we’ll be at Gamescom in Köln, Germany! You can visit us at Hall 2.2. We’ll be doing some press demos there, so if you want to book a slot, please contact us at press@larian.com. Space is limited so be fast…you don’t want to miss this one. 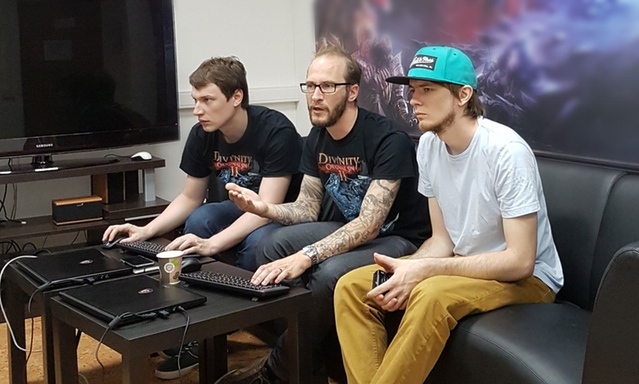 You can expect TONS of coverage over the next few weeks as we’re launching a worldwide press tour bonanza, with members from each Larian office and discipline flying all over the world to show our game to key press in the US, the UK, Russia, Germany, France and the Benelux. We’ll be at PAX West! Come say “Hello!” to us, play Divinity: Original Sin 2, see Swen and the team and snag some awesome merch. We will have some really cool Divine Order t-shirts and Divinity lanyards. If you plan to drop by, you can also expect live game demos of the campaign from Swen (and some exciting surprises). And of course you’ll be able to fight each other in our ever-improving Arena. How do you make a cRPG where you give players plenty of freedom while still letting them experience a powerful narrative, and where you let them play with or against each other? And how do you ensure it feels great in single player? Well, if you’re a developer planning to attend PAX Dev, take note! Swen will be speaking on “Making Narrative Work in a Multiplayer cRPG” on September 1st at 10.30am in the Grand II Hall. He’s talked about this before but now he can finally show everything and it’ll make your head spin. 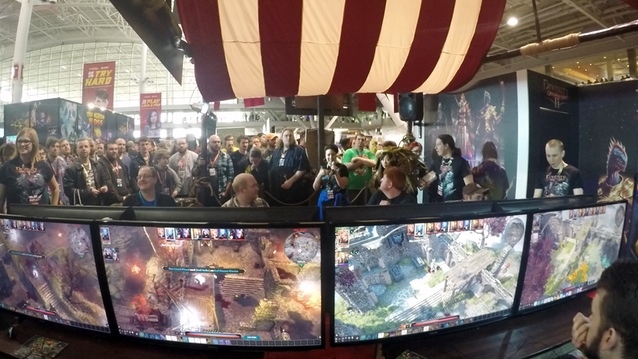 The talk will come with plenty of real examples from Divinity: Original Sin 2. This is fine…Sure, you know how character creation works, and we’ll be revealing a lot in the coming weeks, but what if you have specific questions? Maybe you want to know the precise range of a crossbow vs a bow? The exact hem and cut of Bishop Alexandar’s robe? What do the rats think of what’s going on? We can’t go into that sort of detail in an update, but PC Games N have racked up six hours of gameplay, and they’d love to answer your questions! Head over to the article at PCGamesN.com to ask whatever you like about Divinity: Original Sin 2. Fingers crossed you’ll get an answer when their review goes live. Shout Outs: The Kieron Picks! We asked our writer/designer/graphic wizard/game presenter Kieron what he was excited by on Kickstarter and this is what he came back with. You know the way game development goes? It goes fine. Everything’s fine. The coding will all be finished. That weird bug that turns your team into crabs will be fixed. All the accidentally offensive typos in the dialog will be corrected. It’s fine. Everything’s fine. And what better way to sum up how totally and absolutely fine everything is than a cute dog plushy? The other thing that Kieron drew our attention to was this intriguing project. 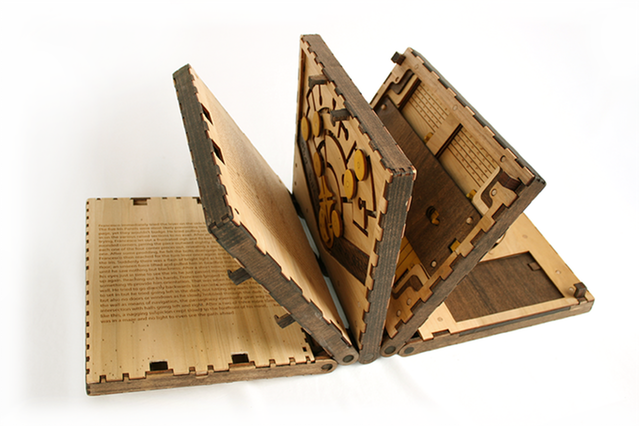 A book that you have to physically puzzle your way through before you can read the next page – this looks like a beautiful melding of engineering and art! That’s all from us right now. But we really do mean it when we say “right now”, because we hope to bombard you with a lot of exciting news over the coming weeks. This is a really important time for us – it’s the first time we’re letting anyone else look at what we’ve been working on for the past year. Normally this would be an incredibly nerve-wracking experience for the whole team, but the more we’ve been looking at the game with fresh eyes, the more okay we feel about that. There’s a lot about this game that we really, really love, and that means we don’t have to work nearly as hard to present it. All we need to do is step back and let it shine. Of course there’s still a lot of work ahead, but we’ve come a long way, and we’re very, very excited to share all that we’ve done with you. So … we’ll see you soon!